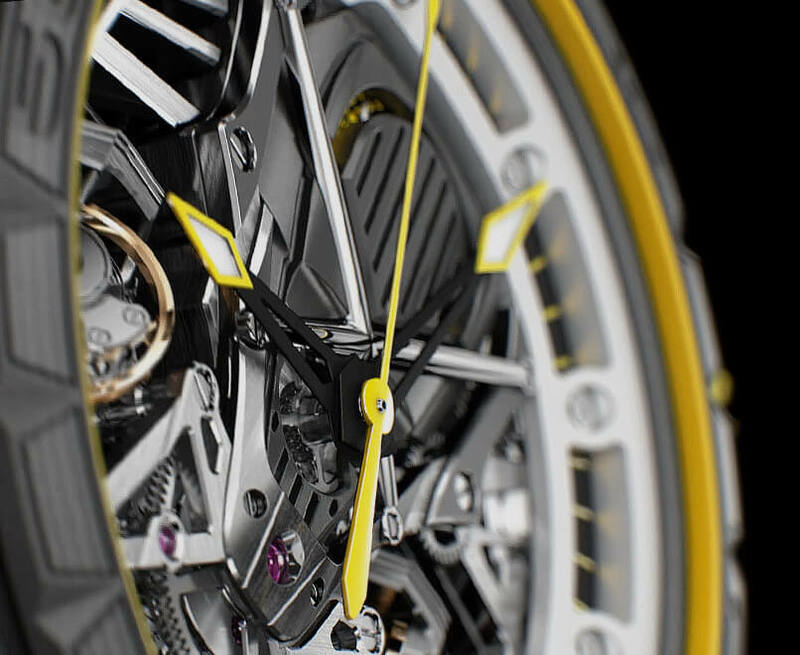 Roger Dubuis is a brand with – subtly said – very expressive watches. They create watches that can’t be missed and have a very wild architecture. One has to adore this kind of creativity, but special it is for sure. The latest collaboration is one that makes a lot of car fans wet their pants. Did I just say that? Yes I did, whilst having a wet pants too. Roger Dubuis has teamed up with one of the Italian supercar brands we all adore: Lamborghini. The Roger Dubuis X Lamborghini Squadra Corse is the beginning of what they call ‘a high-speed fueled collab’. 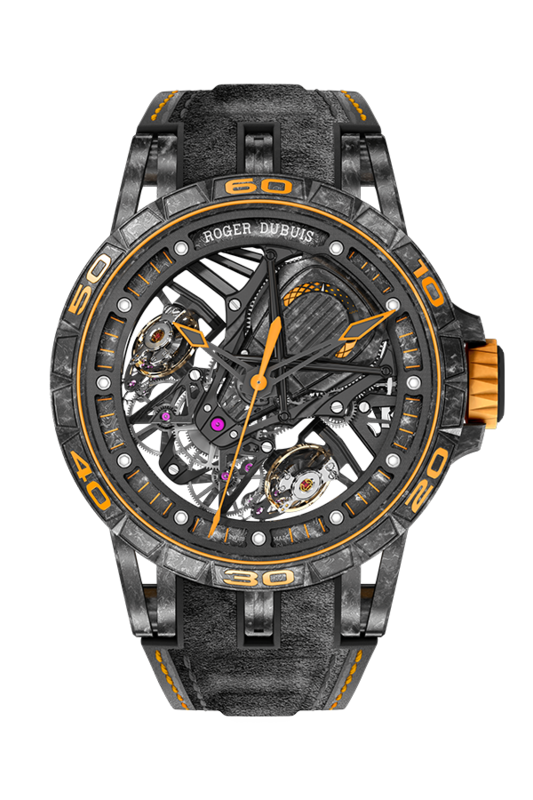 The watch that’s the firstborn as a result of this relationship is called the Roger Dubuis Excalibur Aventador S. A timepiece that will be available in two different editions. One will only come in eight pieces, the other one will count 88 pieces. Both very limited. The two models will be introduced in a carbon/yellow color and a carbon/orange color. Where the yellow one will be made 88 times, the orange one will only be made 8 times. Which means both pieces are very limited. Each watch has a movement lay-out that’s inspired by the roaring engine of a Lamborghini Aventador. Very visible characteristics are the diagonal bars seemingly protecting the movement. These exact same bars also protect the engine and give it a sturdiness. Both watches measure a case diameter of 45mm and are made out of carbon. However, the orange Excalibur exists out of layered carbon, where the yellow Excalibur exists out of C-SMC carbon. Both movements are made out of the same carbon material. It is the same carbon that’s used in the cars made by the Italian manufacturer. 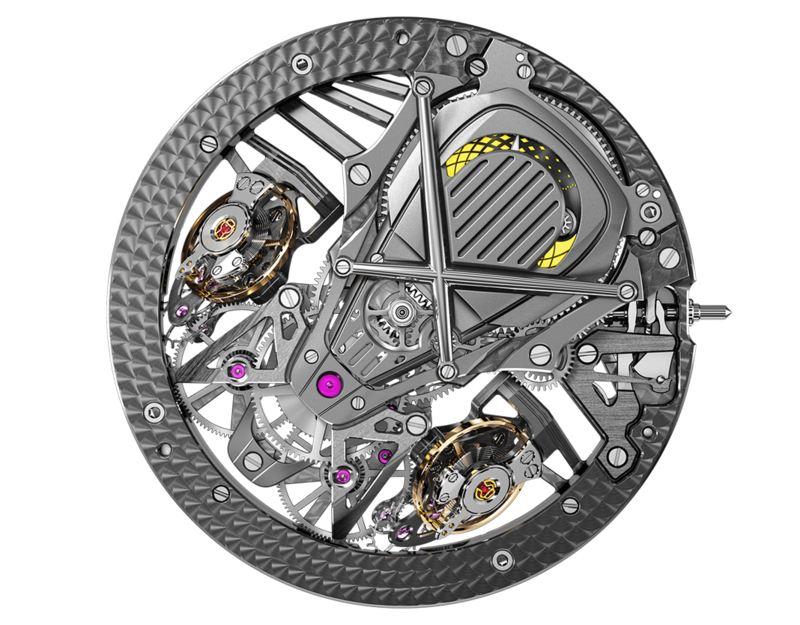 The watches are skeletonized, to ensure the wearer and other drooling public full visibility on the RD103SQ movement. A movement which has a double-balance lay-out with both balancewheels placed in an angle of 90 degrees. Not only does this look very cool, it’s also to require optimal accuracy and power usage. Two times a 4Hz frequency makes that gravity is no match for your Roger Dubuis. Crazy cool and awesome, ruthless and powerful. Makes you wonder why not everyone wears such a machine right? You wear this monstrous (meant in a positive, Pulp Fiction kind of cool way) creation on a strap that’s partially rubber and alcantara. It comes with a Titanium DLC-coted clasp that’s adjustable. If you like your watch over-the-top and different than others, please be sure to buy one of these. It’s a creation that definitely turns a few heads here and there. Besides that, it is fool-proof. There’s no fuel or ignition used in this product, so you won’t have to worry about it catching fire. Which Lambo’s tend to do. Visit their website for more information. Lover of all things watch related. Not fan of a Top 3 existing out of Rolex, Breitling and Hublot. A big supporter of the visionairs within the industry. I try to do my best to explain everything I discuss, but the crazy-minded individual sometimes can't be explained. Grail watch: MB&F Legacy Machine Perpetual. Simply create a folder by clicking the above button. You can also create a collection-gallery relation.